Tatami has many variations, the materials vary, this paired with other factors means there is great diversity in the product. In order to choose appropriate tatami for your needs it is important to select the correct omote (cover) and doko (base). Japanese omote is the best quality in the world, while price varies the durability and aesthetic far out weight cheaper options. Igusa produced in Japan is the highest quality, it maintains its elasticity, durability, and ages well without fading and variation in color. Igusa grown and made in Japan still has grades of quality and type. Motoyama Tatami only buys igusa of consistent quality, directly from reliable producers, our tatami-omote are produced using igusa that undergoes rigid evaluation to maintain its classification. We produce all levels of Japanese tatami. There is correct fit for every situation, from very high-end to regular use. Igusa produced in China is becoming more common in apartments or rental housing due to lower cost. Chinese igusa is harvested approximately one month earlier, it is not fully matured so the surface is more fragile and less durable. Inspection and classification of the Chinese product isn’t stringent so the density and shape of igusa changes a lot when it is used, this creates uneven surface and the longevity of the omote is reduced dramatically. Drying time is much shorter for high volume production, this high volume and shipping also means the igusa needs to be dried more intensely to prevent mold. Over drying reduces the elasticity and the durability. Japan has strict classification standards, in China these are not adhered to, this results lower quality and the color is not stable. In order to make color consistent like the Japanese product a coloring process is often adopted which damages natural material. In cases where the igusa is colored, it will often wear off, clinging to clothes. This method also means the igusa doesn’t gain the golden color you expect in Japan, it becomes unsightly and sunburnt. The Chinese product does have some applications, it is great for rental properties, where the omote needs to be changed often. It is also good for spaces where the flooring receives heavy use and easily is damaged, for example children’s rooms. The high class Chinese product is acceptable for high traffic areas and due to its affordability, having to be changed often. 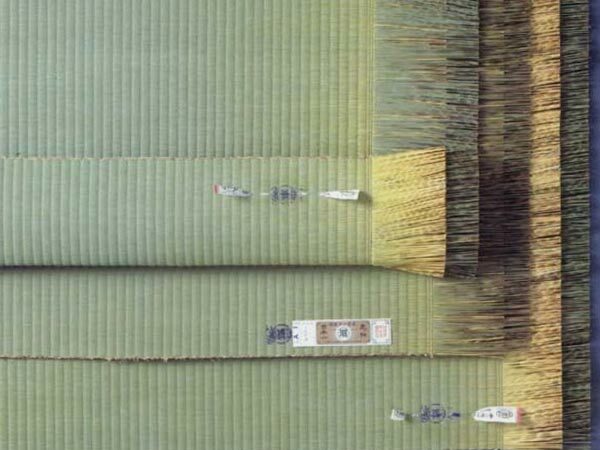 This type of omote is made of ‘washi’, traditional Japanese paper, woven and finished like igusa. It is more durable than igusa. The color only slightly changes, it has no smell and is resistant to mites and mold. One dis-advantage is that washi doesn’t have the air purifying benefits of igusa. Due to the huge range of color you can customize your space. 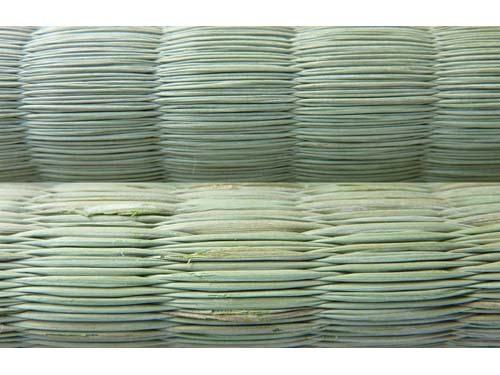 Omote that is dense, thick, and finely woven is durable and beautiful for its life span, aging consistently. As the number of igusa used to create the omote increase, as does the quality and the price. To weave a large number of igusa four linen threads, or combination of two linen and two cotton threads are used – this creates strength. In popular (mid-range) product, only two cotton threads are used. For high end ‘Bingo’, four hemp threads are used. For Chinese omote only one or two cotton strings are used. 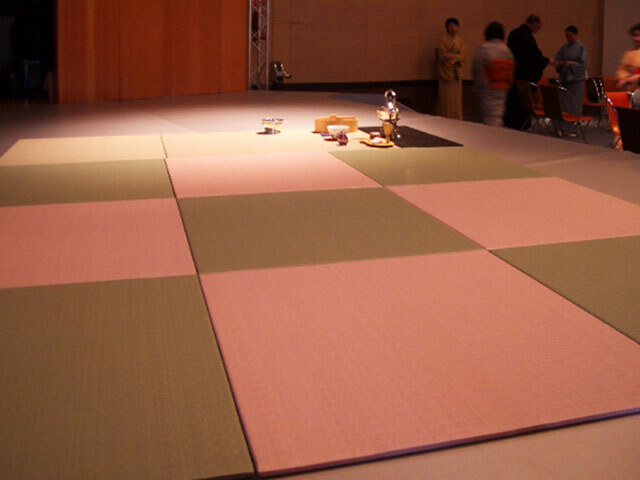 The best way to understand and choose tatami-omote is by touch. Feeling the material gives you a better understanding of the quality & difference. We have samples of various omote. Please contact us. We also have ‘Ryukyu-omote’, ‘Meseki-omote’, used for ‘Fuchinashi-tatami’ (tatami without borders), and ‘Ryubin-omote’ used for Tokonoma space (alcove). We offer wide range of options depending on your project and your taste. Natural base (wara-doko) breathes as it absorbs and releases moisture, which helps control the humidity. Natural base cleans the air in your space, absorbing C02 much more than house plants. 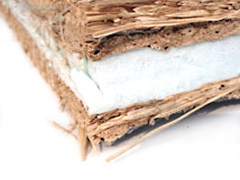 Due to the construction of the base, there are layers of air between the straw, which has natural effect of regulating temperature, this is only achieved with natural materials. 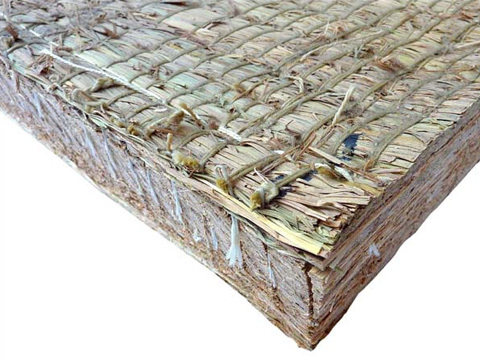 High quality natural base (wara-doko) is highly durable and resistant to humidity. It has a very long life if you take care of it. The straw is laid vertically and horizontally, this means it can recover/bounce back after prolonged use. The air trapped in the base means it has a cushion effect underfoot, making it low impact and creating a luxurious living environment. The synthetic material-base can never achieve this. Modern buildings have reduced circulation. The air tends to be more humid, so natural base can not breathe and function as it would traditionally, releasing moisture effectively. Without proper ventilation it can develop mold and mites. This being said, it is possible to install it in a modern space if you are committed to care for the tatami in these conditions. Price of the natural base (wara-doko) is higher than that of building material-base (kenzai-doko). However, the natural base (wara-doko) is very durable and can be more economical if carefully maintained. Kenzai-doko (board base). Best feature is its price. 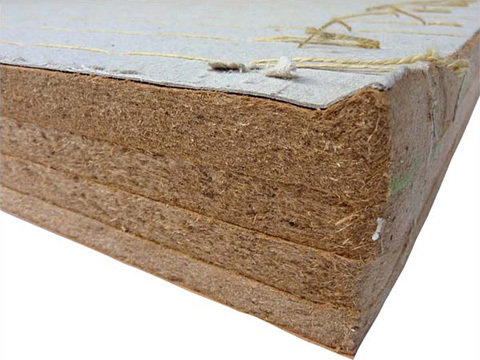 Kenzai-doko (board) is made of insulation board – compressed wooden material and polystyrene foam, is cheap and light. It has a market share of 70-80%. Low incidence rates of bugs and mites, due to its synthetic make-up. Styrene foam used for the core acts as good heat insulation. Foam, generally is not very durable. When sewn it doesn’t bounce back like the natural base, this means the tatami needs to be changed every few years. Due to its density some people don’t like the feeling underfoot. This base is made of polystyrene foam sandwiched between straw. It is light and resistant to humidity also having the added benefit of feeling similar to 100% natural base. Cost wise it sits between natural base and board. To have this as an option mid-range to top-range order is required. We are glad to answer any questions and any concerns you have. Please note the information here is meant to be a guide. We are happy to offer advice to help you select the best option for your needs, taking into consideration your environment, budget, design, etc. Please don’t hesitate to contact us for further information.